Wilde became one of London’s most popular playwrights in the early 1890s. 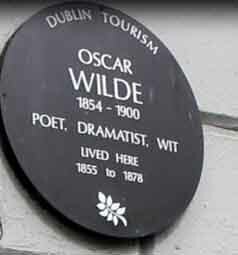 Wilde’s parents were successful Anglo-Irish Dublin intellectuals. Their son became fluent in French and German early in life. At university Wilde proved himself to be an outstanding classicist, first at Dublin, then at Oxford. After university, Wilde moved to London into fashionable social circles. He published a book of poems, lectured in the United States and Canada and then returned to London where he worked as a journalist. where he became one of the best-known personalities of his day. At the turn of the 1890s, he wrote his only novel, The Picture of Dorian Gray. He went on to write Salome in French in Paris and but he produced four society comedies in the early 1890s, which made him one of the most successful playwrights of late Victorian London. At the height of his fame and success, while his masterpiece, The Importance of Being Earnest (1895), was still on stage in London, Wilde had the Marquess of Queensberry prosecuted for libel. The Marquess was the father of Wilde’s lover, Lord Alfred Douglas. The charge carried a penalty of up to two years in prison. Wilde dropped his charges andwas himself arrested and tried for gross indecency and imprisoned for two years’ hard labour. Upon his release he left for France, never to return to Ireland or Britain. There he wrote his last work, The Ballad of Reading Gaol, a long poem commemorating the harsh prison life. He died destitute in Paris at the age of forty-six. Error: Error validating access token: Session has expired on Monday, 22-Apr-19 15:56:05 PDT. The current time is Tuesday, 23-Apr-19 09:59:07 PDT.